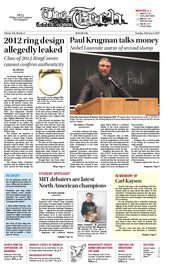 Princeton Economics Professor Paul Krugman PhD ’77 spoke about the economic crisis in 32-123 on Friday. The talk, sponsored by the Undergraduate Economic Association, filled the lecture hall 45 minutes before it began. MIT remains open today as Cambridge is predicted to get 4-9 inches of snow, according to National Weather Service forecasts. Snow emergencies have been declared in both Cambridge (effective at noon) and Boston (effective at 8 a.m.). During snow emergencies, parked cars must be moved off snow evacuation routes. On Sunday, alleged pictures of the Class of 2012 ring design were sent to three dormitory mailing lists from a Gmail account impersonating the Class of 2012 Ring Committee. Members of the actual Ring Committee said they did not send the e-mail, but refused to confirm or deny if the pictures were genuine. On Friday, February 5th, Princeton professor Paul Krugman PhD ’77, 2008 Nobel Laureate in Economics, New York Times opinion columnist and former MIT professor spoke about the economic crisis, comparing it to the Great Depression. Who ever said that engineers can’t communicate? MIT Debate Team members and Course VI majors Adam Goldstein ’10 and Bill Magnuson ’09 took top honors at the North American Debating Championships — regarded as the most prestigious debate tournament in North America — held January 29-31 at York University in Toronto, Ontario, by finishing ahead of 79 other two-person teams from around the continent. Goldstein also earned honors as an individual performer in the preliminary rounds of the tournament, ranking as the top United States speaker and fourth overall speaker for his performance. VALENCIA, SPAIN — USA-17, the challenger for the America’s Cup, and Alinghi 5, the defender, may be stripped-down, lean racing machines, built purely for speed. But both are fully loaded.